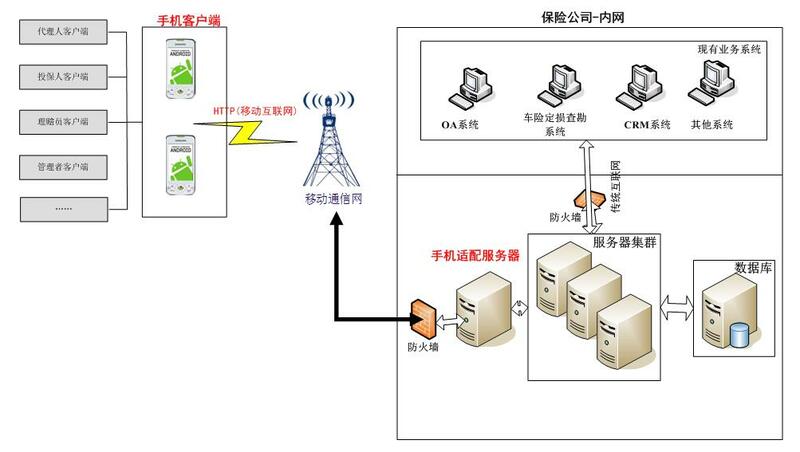 As the above picture shows, this system is divided into two parts: the insurance company side mobile phone adapter server and user side mobile phone software client. Mobile phone adapter server: integrate with the insurance company existing business system through the application integration interface, to realize information system applications to the extension of the mobile terminal, completing the user management, log management, client management, digital certificate management, data docking, etc. Mobile phone client: integrate digital certificate application, access via the Internet or the APN line way (Access Point Name, namely Access points, commonly known as the Name of the virtual local area network), realize personal identity authentication, wireless channel encryption, core process signature etc. function.